He was speaking on Monday at a "High-Level Lunch on Digital Transformation in Africa" on the sidelines of the 32nd Ordinary Session of the African Union in Addis Ababa, Ethiopia. Delegates at the meeting in Addis-Ababa yesterday. Village Urugwiro. "Information must be protected from unauthorised access. It should be clear who owns the data that people generate and how it will be used," he said, adding that different digital platforms must also be able to seamlessly communicate with each other. "Otherwise, we are merely rebuilding the same fragmentation in the cloud that we have been working to transcend here on the ground in the African Union. That is why working together to design common standards and guidelines, that serve Africa's unique needs, is as important for e-government, as it is for e-commerce," he added. "In this case, e-government is a powerful tool for improving both the quality and accessibility of government services. 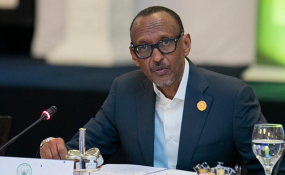 In Rwanda, we have used the Irembo platform to make many public records available online, such as land titles, birth certificates, visas, driver's licences, national ID, and even mountain gorilla trekking permits," he noted. At the meeting, Lacina Kone from Côte d'Ivoire was appointed as the new Director General of the Smart Africa Secretariat, replacing Hamadoun Touré, a Malian native, who had served the secretariat for about three years.